In stark contrast to fellow 2nd Round Draft Pick Mitchell Hansen, Josh Sborz (chosen 74th overall by the Dodgers) hardly has any Baseball cards available. There are no major manufacturer cards, and the cards that can be found are of the college/university made variety. Take a look at them below. 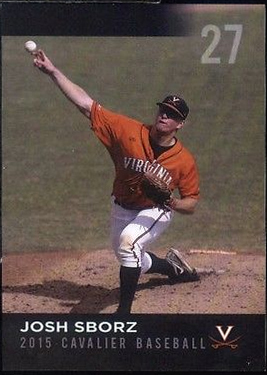 As member of the University of Virginia Cavaliers ballclub he has been included into three of their teamsets sold at the school - from 2013 to 2015. In the photo below (pic grabbed from an eBay auction featuring Sborz cards for sale, here) the card years are shown from left to right; 2013, 2014 & 2015. 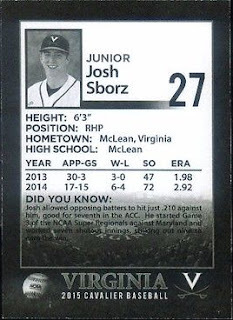 And here is a more detailed look at Sborz's 2015 Baseball card.